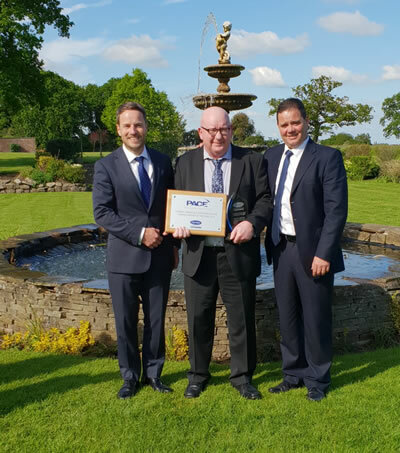 For the second year running, County Down-based Carrier Transicold Northern Ireland was named Network Service Partner of the Year at Carrier Transicold UK’s Performance Assessment and Competitive Excellence (PACE) awards. Carrier Transicold, which operates in the UK as Carrier Transicold (UK) Limited, is a part of UTC Climate, Controls & Security, a unit of United Technologies Corp. (NYSE: UTX). Carrier Transicold Northern Ireland secured the top spot within the company’s service partner network with an impressive score of 97 per cent – the highest in the history of the PACE programme – beating its 2017 result of 95 per cent. Scores are based on 29 key performance indicators (KPIs) across 39 service standards, which include breakdown response times and spare parts availability to ‘first-time fix’ rates and planned maintenance completion figures. Vincent Marmion, manager, Carrier Transicold Northern Ireland, dedicated the award to the late Gerry Callaghan, a former sales and service representative who helped to set up Carrier Transicold Northern Ireland in 2003, and played an instrumental role in the business receiving its first PACE award in 2017. Two service partners owned by Lynton Refrigeration Ltd rounded out the top three PACE award winners. Carrier Transicold Northern (Stockton) placed second, also a repeat of its 2017 achievement, while Carrier Transicold Manchester placed third. “This is a fantastic achievement and really shows the dedication and hard work that both teams have put in over the past 12 months,” said Scott Walsh, operations director, Lynton Refrigeration Ltd. The PACE Recognition Award went to Carrier Transicold Cornwall for its commitment to excellence, having recently invested in a new depot and demonstrating dedication to consistently developing the skills of its seven engineers. Carrier Transicold’s network service partners, based in 22 key locations across the UK, are independent companies that provide support to customers operating Carrier Transicold equipment on their light commercials, trucks and trailers. They collectively employ more than 160 mobile service engineers. Carrier Transicold helps improve transport and shipping of temperature-controlled cargoes with a complete line of equipment and services for refrigerated transport and cold chain visibility. For more than 45 years, Carrier Transicold has been an industry leader, providing customers around the world with advanced, energy-efficient and environmentally sustainable container refrigeration systems and generator sets, direct-drive and diesel truck units, and trailer refrigeration systems. Carrier Transicold is a part of UTC Climate, Controls & Security, a unit of United Technologies Corp., a leading provider to the aerospace and building systems industries worldwide. For more information, visit www.carriertransicold.eu. Follow Carrier on Twitter: @SmartColdChain. Pictured L-R: Scott Dargan, Managing Director Northern Europe, Carrier Transicold; Vince Marmion, Depot Manager, Carrier Transicold Northern Ireland; Neil Maher, Network Operations Manager, Carrier Transicold Europe.